Gaana 3.0 – amazing way to listen to music on your smartphone! Recently I read about the launch of the Gaana 3.0 app which is a reworked and much improved extension of Gaana app for smart phones. I had to immediately try out the same! So tried out the app on my android phone. The first look was very impressive, very clean layout of new releases and top charts with information about editor’s picks followed by many other segments. When you select an album like say “Dhoom 3”, you get a sleek layout where you get all the information about the album like number of songs, number of favorites marked by people in this album. It also gives you an option of Favoriting an album or download it in case you have a Gaana+ account. You can also select the option of shuffle playing all the songs in the album or sharing the album on social networks. One more feature I like is, quickly favoriting an individual song while knowing information about who sung the song. Once you click on a song, a very suave player opens up which shows a picture associated with the song and also more details like adding it to a radio, sharing it, favoriting it and adding it to a playlist. You can also use this interface as any smartphone’s audio player! Radio feature in Gaana 3 appÂ offers listeners an opportunity to tune in to a variety of pre-programmed radio streams (Radio Mirchi streams & Gaana Radios), featuring popular Radio Jockeys’ bytes, Celebrity favorites and loads of curated music. The main attraction being â€œOne Touch Radioâ€ which plays continuous music based on a userâ€™s music taste. Gaana 3.0, the app with a refreshing new look, is packaged with a faster search engine, which makes it easier to browse, discover and favorite music from a large collection of over 3 Million songs! The available music catalogue is spread across Bollywood, International and Regional spanning 18 languages and multiple genres. Through the discover option on your smart phone, you can see the top charts at one view, featured channels, radio mirchi, stars, romance, party, festivals, genres, moods, devotional, workout and rock. Quickly showing you the features of my profile section on Gaana 3 app. It shows a count of number of my followers on the app and also the number of people I’m following. This gives me an idea of music tastes of my friends on Facebook and also gives my friends an idea of the kind of music that I like. If you have listened to a song, it will appear under ‘Activity Section’ under ‘my profile’ and we can quickly get information about the same. It also shows you how many of your friends on your timeline are listening to what kind of music so you can quickly listen to the same music too! Finally would love to talk about this wonderful offer by Gaana where for every friend you invite to join Gaana, you get a free week of Gaana+ which gives you unlimited downloads, no ads and much much more! You can invite via Facebook or Email right now. Hrish Thota is India's top blogger and social media influencer since the last 17 years who has worked with more than 200 brands both in India and Internationally. He was No.3 to join Twitter in India around 12 years back and has been verified by them as a public figure. Hrish has been awarded with Best Lifestyle Facebook Page award by Food Bloggers Association of India and Best Influencer in India by Social Samosa. 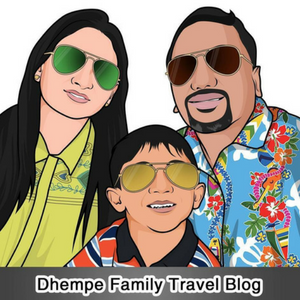 Copyright © 2018 #DhempeTravelBlog. All rights reserved.